One of the original Galilean Moons of Jupiter. Prior to Humanity's outward growth, it was an ice-bound moon. It is now a member UNS. It is known for its ice-fishing 2000-11-08. 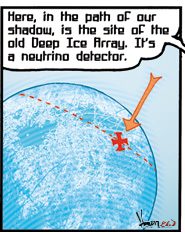 It is home to the Deep Ice Array, a neutrino detector 2014-03-23. Colonized in the same time period as Venus and Mars. The **Princess Tyola** was in orbit around Europa for an anti-teraport refit when it was infested by Diamond Beetles 2001-10-01. The Duty Office of the Chief of the U.N.S. Secret Foreign Whatever* is located on Europa. 2015-03-12. Mentioned by Chief Warrant Officer Gunther Thurl on 2000-11-08. Seen as a blue dot in the distance on 2001-02-05. First physical appearance on 2001-10-01. Neosyncronicity is scanned by the Deep Ice Array 2014-03-23 as it enters the Sol Teraport Interdiction Zone.